If your home, commercial property or business premises is at risk then you need the best security company Brisbane has to offer. Whether you require a permanent or part-time Brisbane security officer or a team of professional guards, we can usually accommodate your needs even at short notice. If you are planning a special event that needs to be secure, we have the solutions for you. The Brisbane Dog Security team employees and trains both male and female security personnel which are available for hire in Brisbane, Gold Coast, Logan, Ipswich and surrounding Queensland suburbs. Whatever your security needs, we always strive to provide an outstanding level of service that meets your requirements with the highest quality professionalism possible. Whatever your security needs, Dog Security in Brisbane can meet the demand with the highest quality protection and service available. When you contact us we will thoroughly discuss your security needs with you in order to identify a solution that is perfectly matched to your security issues at your residence, workplace, party or event. We have a network of security personnel that we work with in Brisbane, Logan, on the Gold Coast and in Ipswich. We also have a catalogue of dogs we have handpicked in order to match the right dog to your security needs. One of our highly trained Brisbane security guards, partnered with one of our expertly trained dogs, form a formidable opposition to any security concerns. When you hire a security guard and accompanying dog you benefit from vastly increased security. It is virtually impossible to remain undetected against a security guard and dog team, which means your protection needs are be completely met. Dog Security import, breed and train a number of dog breeds in Brisbane, including Dutch Shepherds which are ideal for security solutions. Through expert training your own security dog can provide you with the safety your property requires. Dog security training is beneficial as a professionally trained K9 possesses heightened senses which can detect human scent and other odours. This unique detection ability can provide you and your family with confidence when it comes to your home security and protecting your estate. 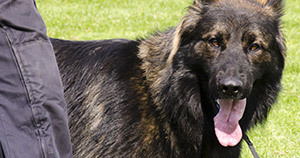 We can provide you with one of our highly trained security dogs, or we can also import and train your own security dog. Providing secure protection for your home is our priority. We understand that when it comes to your home, it is important to have peace of mind about your safety. We provide a range of home security solutions Brisbane and across Queensland, including dog security, mobile patrols and monitoring. Our team can evaluate your property and walk you through the best security options for your home. Some security options we may suggest include an effective burglar alarm, CCTV cameras, local Brisbane security patrols or own dog security. We are a trusted supplier of high quality security solutions for industry and construction sites in Brisbane and across Queensland. Our expertly trained team are able to offer effective quality security services, in-line with customised procedures which ensure you receive the highest standards in service. We have many years of experience providing security solutions for industry and commercial sites, so you can rest assured that your site will be protected. When it comes to providing security solutions for gated communities and retirement homes in Brisbane, we make it our priority to provide effective security services that do not impact on the atmosphere or the comfort of those residing there. Dog Security enjoy an increasingly popular reputation in providing high quality security services for gated communities and retirement villages. If you would like to learn more about our security guard and dog services in Brisbane’s gated communities and retirement villages, please contact us today. If you would like to make an enquiry about our security services in Brisbane please contact Dog Security today.